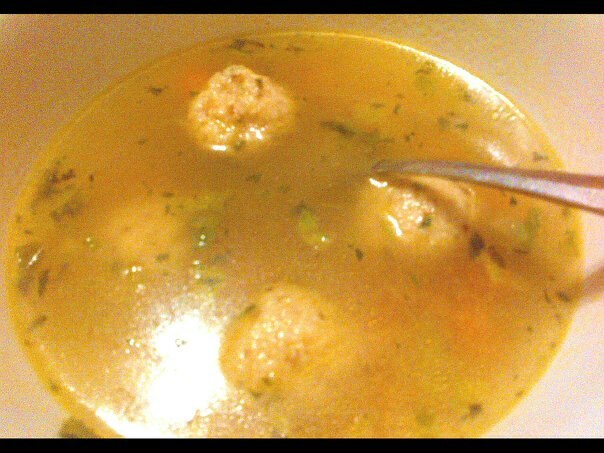 We all have our remedies for feeling better and getting over an illness, most think chicken soup but I think matzo ball. This has all the components of a chicken soup but heartier and so delicious, if you have never had this soup you will definitely be craving it over and over again...even if your not sick. A traditional favorite made vegan, eat by itself or have it will a salad and bread. You can't go wrong with this hearty delish soup. Enjoy! Put the celery, carrots, onion, parsley, thyme, garlic, (vegan chicken if using), and salt & pepper in a large pot. Bring to medium-high heat and saute for 5 minutes. Add stock and cook until boiling reduce the heat to low and Add matzo balls to soup mixture (that is NOT boiling, just a low simmer or the matzo balls will break up), cook until firm but tender and cooked through, about 30 minutes. Make The Vegg as directed. In a medium to large bowl, beat the The Vegg eggs, oil, and seasonings in a mixing bowl. Fold in the matzo meal and mix until fully incorporated. Store the mixture, covered, in the refrigerator for a minimum of 2 hours, or overnight (if over night the mixture may dry up, dehydrate with a Tbsp of hot water until mixture is workable). Take out and roll 1 Tbsp of dough into balls with damp hands. Cover and chill until ready to cook.